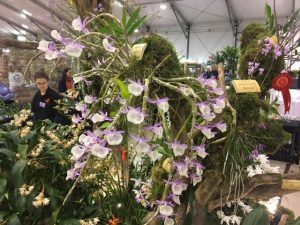 This is one of the plants we are delighted to have carried to Paris with us for the European Orchid Show. 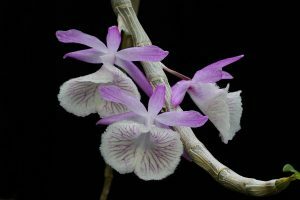 Dendrobium primulinum is another species we have seen in our travels to the Himalayas where we found them on the trunks and lower branched of large semi deciduous trees in seasonally dry lowland monsoon forest. Plants therefor experience warm wet summers and cooler dry bright winters but never the low temperatures of the cool growing Himalayan species. It has taken us a while to get growing conditions right for this species. Keeping plants warm and watered yielded no flowers at all. Giving a cool winter rest in ‘Cool Asia’ resulted in rotting bulbs. keeping plants warm throughout the year but dry in the winter gave some flowers but poor shrivelled plants. The solution for us is warm wet summers in ‘Warm Asia’ (min 17C) followed by a completely dry winter hanging in the roof of ‘Cool Americas’ (min12C). The result is a fantastic blooming from last year’s pseudobulbs and and a true representation of the wonderful display this species gives in the wild. The species has considerable variety in flower colour with many types having considerable yellow on the lip (as the name suggests) but our plant is the cream and pink type. Here is our plant on the display in Paris.